NASA scientists have found evidence that Mars’ crust is not as dense as previously thought, a clue that could help researchers better understand the Red Planet’s interior structure and evolution. 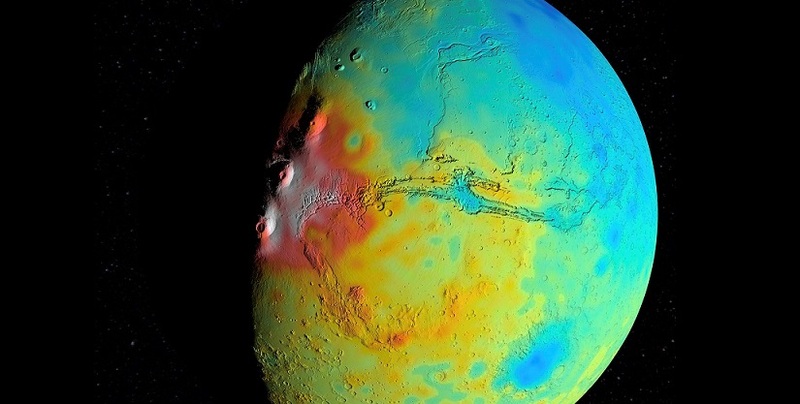 A lower density likely means that at least part of Mars’ crust is relatively porous. At this point, however, the team cannot rule out the possibility of a different mineral composition or perhaps a thinner crust. The researchers note that NASA’s InSight mission — short for Interior Exploration using Seismic Investigations, Geodesy and Heat Transport — is expected to provide the kinds of measurements that could confirm their finding. This Discovery Program mission, scheduled for launch in 2018, will place a geophysical lander on Mars to study its deep interior.